Kimberly began her journey in preventative medicine in 2003. Utilizing her background in Eastern Medicine Studies, she started her fitness career working with the Division One Varsity Athletes at Northwestern University teaching injury prevention stretching based on the principles of Eastern Medicine’s 5 Element Theory. In 2005 she became founder and head coach of NJOY Racing in Chicago, IL, USA where she trained and coached triathletes and runners at all levels. Throughout her coaching career she has trained the USA Para Olympian Silver medalist and World Champion (above knee amputee female triathlete) which gave her an in-depth look at how the body can adapt biomechanically to movement and compete at world class levels. During her time coaching they broke the world record in the 400 meter dash, as well as the marathon for her category. From 2006 to the end of 2011, Kimberly taught a variety of classes from cardio boot camp to joint mobility, stretching, swimming and indoor cycling to running for Equinox Fitness in the downtown Chicago Area. Building a very successful treadmill program during that time lead her to the opportunity in 2009 to work with the internationally known treadmill company Star Trac Fitness, where she is Star Trac Coach® on their ETrX-Series Treadmills, coaching runners and walkers through an endless number of workout combinations. She continues to work as a Master Trainer for Star Trac, teaching their personal trainer continuing education programs of Human Sport® and BoxMaster®. In 2013 Kimberly joined Trigger Point® Performance as one of their North American Master Trainers, teaching their Foam Rolling and Myofascial Compression Technique continuing education courses. She has also worked as a Master Trainer for Schwinn Indoor Cycling since 2008. Kimberly taught in Chicago for Lakeshore Sport and Fitness for three years leading up to her transition to moving to India. As a mission to help bring better education on health and fitness to India, Shah spent her time studying and learning the fitness industry for 5 years before fully settling in India. Shah moved to India full time be able to focus full time on her mission by working as a consultant to gyms, health and fitness organizations throughout the country. ​In 2014 she worked with LS Sports, in Ahmedabad, Gujarat and produced the largest triathlon to date then, in India, while introducing the sport as it’s very first event in the state of Gujarat. She has been a keynote speaker and presenter for FICI-FLO and Gold’s Gym India and spoken with other organizations and for fitness clubs throughout the country. Currently Shah trains business executives in Mumbai and continues to give lectures, education and talks throughout the country on health and fitness. She is partners with the fitness studio FitPark, located in Khar West, Mumbai which provides fitness space solutions to independent trainers in the area. Kimberly is also the co-owner of the Adidas Creators Premier League women's football team Queen Bees. In 2018 Shah spoke at Navrachana University in Vadorada, Gujarat for TEDx on the topic, Health is a Lifelong Investment (see the full video here) and is scheduled to give her second one in Goa, January 2019. Shah continues to work with coaching endurance athletes for triathlons and marathons in Mumbai and has created a fitness lifestyle program to get those who have a busy life on the road or is beginning their journey to living a healthier NJOYable Lifestyle. Shah also is a brand representative for Garmin India and Steadfast Nutrition. An athlete herself, Kimberly has traveled the globe competing in triathlons and road races of all distances from 5km runs to the Full Distance Triathlon (3.8km swim/180km cycle/42km run). She has been part of Team USA multiple years and has her highest placing of 13th at the World Championships and 3rd in America in the sprint triathlon distance. 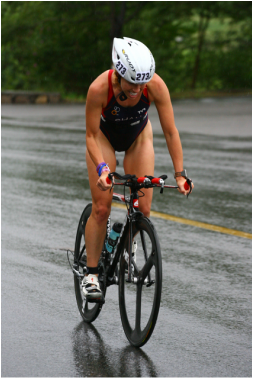 In 2014 she won the overall Chicago Triple Challenge (racing all 3 Chicago Triathlon races) in addition to taking overall female win of the Chicago Super Sprint Triathlon, named All-American for multiple seasons in the sport, and took 3rd at the Aquabike US Nationals 2014.